What could beat the Canadian Rockies as a place to go RV camping? Nothing, I’m betting. It’s got some of the world’s most famous scenic drives, including the Lake Louise to Jasper drive that takes you through the Columbia Icefields along the way. 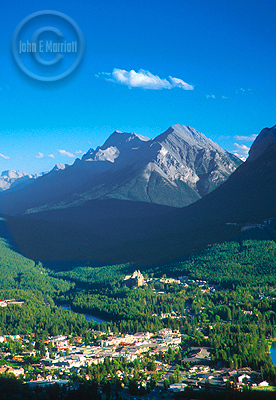 Come visit one of the world's greatest RV camping spots here in Banff. It’s also got terrific camping in some of the world’s most beautiful national parks, including Banff National Park and Jasper National Park, and great towns, such as Canmore, Banff and Jasper. Here you’ll be able to enjoy great Rockies vacation activities such as rafting, hiking, mountain biking, fishing and horseback riding. One great place to set up camp in Banff is the Tunnel Mountain campground. The Tunnel Mountain campground is in Banff National Park, just outside of Banff townsite. This is Banff’s largest RV camping area, with 320 sites. Staying here, you’ll get great views of the valley, the Hoodoos and the Banff Springs Golf Course. It is located on Tunnel Mountain, just 2.4 km from the town of Banff. Which means you’re in easy walking distance from town. This can be nice if you don’t feel like pulling up stakes with the RV and coming in, or could use some time on your feet after some long drives. The Tunnel Mountain campground has good services itself, including food, laundry and even a waterslide are nearby! It is also the only campground in the national park that has full RV hookups available (15 and 30-amp electrical hookups, water and sewer). So it’s sort of the RV’ers mecca for camping. The sites can accommodate large RVs, up to 50-feet long, and are pull-through (not just back-in). Some of the sites are reservable, while others remain open for visitors on a first-come, first served basis. The campground is open from early May to early October (reservable May 14- October 3). Visit Parks Canada Campground Reservation Service or call toll-free to 1.877.737.3783 (1.877.RESERVE) to reserve your spot at the Tunnel Mountain Trailer Court in Banff National Park. Please note that reservations must be made at least 24 hours in advance. You may also want to visit Parks Canada for descriptions of all campsites (reservable and non-reservable) on national park grounds.